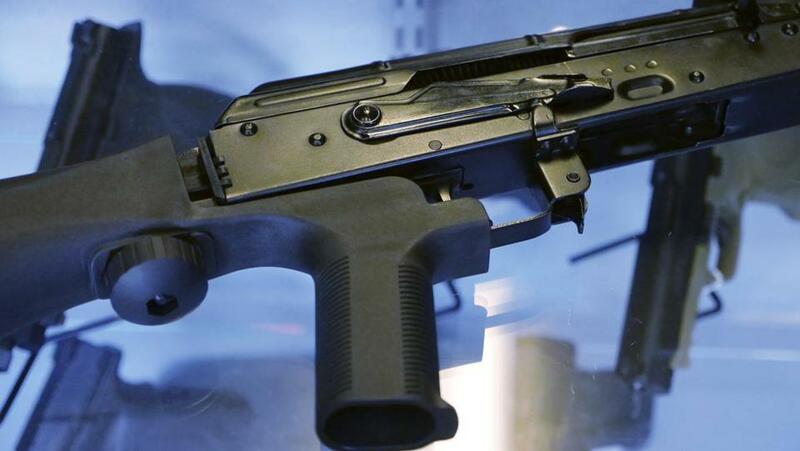 A device called a “bump stock” was attached to a semiautomatic rifle at the Gun Vault store and shooting range in Utah earlier this month. WASHINGTON — One month after the deadliest mass shooting in the country’s history, a legislative ban on the automatic firing device widely blamed for the tragically high number of victims has become mired in bureaucratic quicksand. After gunman Stephen Paddock killed 58 people and injured hundreds more at a Las Vegas country music festival on Oct. 1, a bipartisan plan to ban the accessory device that elevated his semiautomatic weaponry to rapid automatic fire seemed attainable. But mere weeks after high-profile Republicans signaled their willingness to act on what are known as bump stocks, Congress has yet to even hold a hearing on the bills put forward in either house. The National Rifle Association blunted the push for rapid action. In the fine print of the NRA’s statement on the shooting, released four days after the killings, the group expressed surprising openness to regulating bump stocks, But its suggestion to leave the issue to the Bureau of Alcohol, Tobacco, Firearms and Explosives has stymied all movement in Congress to pass a new law. The ATF said in 2010 and 2012 that it does not have authority to ban the stocks. Now, in the aftermath of the Las Vegas massacre, the Department of Justice has said it is reviewing the bureau’s authority over bump stocks, and will not provide an estimate on how long that review will take. Republicans, who shy away from the idea of voting for gun control, appear happy to wait, leaving House and Senate bills in a holding pattern. 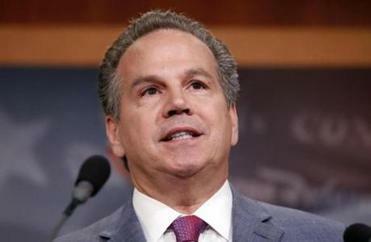 Representative David Cicilline of Rhode Island said fault lies with top Republicans in the House. Meanwhile, weapons retailers say bump stocks have been flying off the shelves, although orders are tapering off modestly as news about the horrific slaughter at a country and western music concert dies down. In the Las Vegas gunman’s hotel room, authorities found 12 bump stocks attached to firearms, according to media reports. A bump stock attaches to a semiautomatic firearm to increase its firing speed, allowing the gunstock to bounce back and forth rapidly between the shooter’s shoulder and trigger finger. The ATF declined to regulate the device during the Obama administration. The bureau determined bump stocks to be a gun accessory, not a gun itself. Representative Carlos Curbelo, a Republican from Florida, is certain that the effort on Capitol Hill over a bump stocks ban will be revived eventually. But for now, he said lawmakers are waiting for word on whether the ATF has the power to regulate bump stocks themselves. The next step for Curbelo and Cicilline to move their bills forward is a hearing in the House Judiciary Committee. A spokesman for Republican Representative Bob Goodlatte, who chairs the committee and can schedule a hearing, would not say whether the chairman is considering it. She said the chairman has reached out to the ATF on the matter. 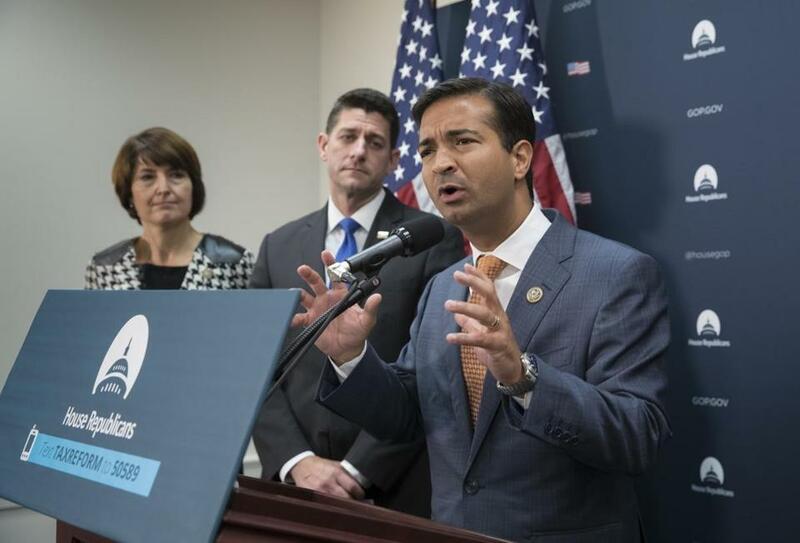 Representative Carlos Curbelo, Republican of Florida, said he’s confident that legislation banning bump stocks will move forward. A spokeswoman for House Speaker Paul Ryan said the Judiciary Committee is discussing the issue with the ATF but declined to say more. At a news conference 10 days after the shooting, Ryan told reporters that he favored handing the issue to the ATF for now. “We think the regulatory fix is the smartest, quickest fix,” he said. A spokeswoman for the ATF left the issue an open question, saying that although the bureau generally does not have authority over firearm parts, if an accessory converts a firearm into a machine gun, it may be subject to regulations. So far, Massachusetts is the only state to take substantive action toward banning bump stocks in the aftermath of the massacre in Las Vegas. Bills banning the devices passed both the state House and Senate, but legislators have yet to agree on unified language. Governor Charlie Baker has signaled that he will sign it if it arrives on his desk. California already had such a ban on the books. California Senator Dianne Feinstein has led the charge in the Senate toward a bump stock ban, but in a brief hallway interview on Thursday, she was reluctant to talk about it. “No, not at this time, sorry,” she said in response to a question about her legislation, adding that she expected to get a hearing on it. The lack of a clear national response in the wake of such a profound tragedy is generating deep frustration among gun control advocates. Instead, Brown said she has watched as many Republicans hew to the NRA playbook. The Brady Campaign has taken action in court to punish manufacturers of bump stocks, arguing they have been negligent in marketing the product to the general public without sufficient regulations. Earlier this month, the group filed a class action lawsuit against Slide Fire Solutions and other manufacturers of the device, asking for money to fund counseling for survivors of the shooting. The NRA and Slide Fire did not respond to requests for comment. Slide Fire, a Texas-based manufacturer, is hardly threatened by financial ruin in the wake of the massacre. Talk of legislation banning bump stocks set off a frenzy of gun-owners seeking to purchase them. Prices on online auction sites like “Gunbrokers.com” are surging. While the typical bump stock goes for about $200, some are now selling online for $1,000, said John McConkey, owner of The Modern Sportsman, a gun seller that markets its products online. McConkey said his store, based in Minnesota, started selling bump stocks in 2010 — back when they were just a toy that few took seriously. McConkey estimates that he sold about 100 bump stocks in the five years before the shooting. In the past month, he said, he has sold about 500. “Everyone wants what they can’t have, what they might not be able to have tomorrow,” McConkey said. The NRA’s openness to regulations on bump stocks after the Las Vegas massacre surprised many. After the Sandy Hook shooting in 2012, which resulted in the deaths of 20 young children and six adults, NRA executive vice president Wayne LaPierre called for “armed police officers in every school,” angering those who favored tighter restrictions on buying semiautomatic assault rifles. Massachusetts Representative Seth Moulton, who introduced the House legislation along with Curbelo, said he is confident that his bill would pass if it could only get it to the House floor. But he admitted his frustration that in order for it to get there, lawmakers will have to wait to hear back from the ATF first. “We need a formal answer from them and then we’ll see what comes next,” Moulton said. 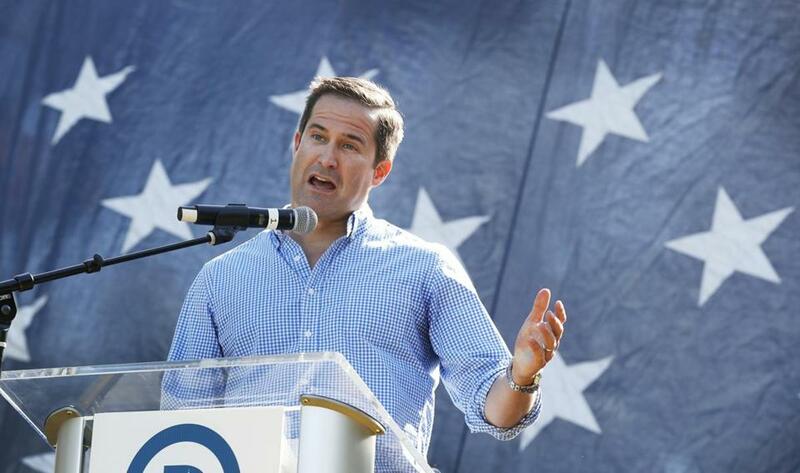 US Representative Seth Moulton has admitted to his frustration on the lack of action on banning bump stocks.